American public opinion about Germany spiraled from ignorance and isolationism to a sense of danger and interventionism. This realistic replica is a pre-built model, not a toy. Although perfect for displaying on a mantle, shelf or desk, any child who gets into a bathtub and plays with this is going to be disappointed. Spain: Day 41 of 985 of the Spanish Civil War. Spain: Day 406 of 985 of the Spanish Civil War. CBI - China: Day 51 of 2,987 of the 2nd Sino-Japanese War. Day 14 of 106 of the 2nd Battle of Shanghai. Spain: Day 771 of 985 of the Spanish Civil War. CBI - China: Day 416 of 2,987 of the 2nd Sino-Japanese War. Day 77 of 139 of the Battle of Wuhan. Canada: The Canadian Government issues orders for the call up of their militia to protect coastal defenses and vulnerable industrial points. Also, the Irish Regiment of Canada is called to active duty. UK: 70% of Britain's Air Defenses are now deployed, which effectively means that 900 guns and 3,000 searchlights are ready for action. France: French Prime Minister Êdouard Daladier sends a message to Hitler, noting that while France desires peace, they will fight for Poland should they be invaded. Germany: Hitler postpones the invasion date of Poland, originally set for this day, and moves it to September 1st. Meanwhile, Hitler publicly guarantees the neutrality of Belgium, Netherlands, Luxembourg, Denmark and Switzerland. Germany: Some of the scheduled lead German units for the invasion of Poland do not receive the message that the invasion date has been moved. They cross the border as planned and attack the Polish defenses with rifles, machine guns and grenades. Within a few hours they get the message and fall back into Germany. However, the Polish leadership brushes off the incident as nothing more than another provocational tease, even though the attackers were wearing Polish uniforms. Italy: Mussolini sends Hitler a message saying that Italy will offer political and economic aid if Germany chooses to go to war with Poland, but they are in no position to offer any military assistance. Germany: The German Navy orders all German merchant ships to sail for the nearest German port. CBI - China: Day 781 of 2,987 of the 2nd Sino-Japanese War. CBI - Mongolia: Day 108 of 129 of the Battle of Khalkhin Gol, a border dispute between the Soviet Union and Japan. Atlantic: The Luftwaffe attacks two British ships 10 miles east of Kinnaird Head, Scotland, immediately sinking the REMUERA and severely damaging the CAPE YORK which will sink tomorrow. ETO - Ireland: The Irish government protests to Berlin about bombs accidentally being dropped in County Wexford, which killed three girls. ETO - UK: Day 48 of 114 of the Battle of Britain. The Luftwaffe bombs airfields and towns in Kent, near London and in Portsmouth. ETO - Germany: The RAF night bombs at Leipzig, Leuna, Hanover and Nordhausen. MTO - Italy: The RAF bombs at Turin and Milan. The Italian sub DANDOLO sinks the British steamer ILVINGTON COURT. East Africa: Day 78 of 537 of Italy's East African campaign in the lands south of Egypt. Chad declares war on Germany and Italy. The German armed merchant cruiser PINGUIN captures the Norwegian tanker FILEFJELL off Madagascar and then sinks it. CBI - China: Day 1,147 of 2,987 of the 2nd Sino-Japanese War. Day 286 of 381 of the Battle of South Guangxi. Day 7 of 42 of the Hundred Regiments Offensive. Atlantic: German sub U-571 seriously damages the Soviet supply ship MARIJA ULJANOVA 27 miles north of the Teriberskij lighthouse in northern Russia in the Barents Sea. The ship will be written off as a total loss. ETO - Norway: British, Canadian and Norwegian commandos land on Spitzbergen to deny the coal mines there to the Germans. They destroy mining equipment and evacuate the Norwegian population. 02 Dec 43: Shortage of British coal miners forces conscription of "Bevin Boys"
ETO - France: Paul Collete is arrested for shooting and wounding Pierre Laval. Later Laval will recommend giving Collete a light sentence, saying the young man was likely just a pawn used by more senior plotters behind the scenes. Hungary: The Hungarian Army rounds up 18,000 Jews at Kamenets-Podolsk. Russian Front - Finland: Day 59 of 142 of Operation SILVER FOX, a joint German-Finnish campaign to capture the Russian port of Murmansk in the Arctic. Russian Front - Finland: Day 57 of 140 of Operation ARCTIC FOX, a joint German-Finnish campaign against Soviet Northern Front defenses at Salla, Finland. Russian Front - Finland: Day 66 of 164 of the Battle of Hanko. Russian Front: Day 66 of 167 of Germany's Operation BARBAROSSA, the invasion of the USSR. Russian Front - North: German Army Group North continues encircling Leningrad. Russian Front - Center: Troops from German Army Group North heading south to help out down there surround Velikije Luki, Russia, and destroy the Soviet troops defending there. Russian Front - Center: Day 10 of 23 of the Battle of Dukhovshina, Russia. Russian Front - Center: Day 34 of 38 of the Battle of Gomel, Belarus. Russian Front - South: Day 4 of 35 of the 1st Battle of Kiev, Ukraine. Panzer units of both German Army Groups (Centre and South) continue trying to encircle Kiev. Russian Front - South: German units from Army Groups South continue building up their forces around Stalingrad. Russian Front - South: Day 19 of 70 of the Siege of Odessa, Ukraine. MTO - Libya: Day 139 of 256 of the Siege of Tobruk. Middle East: Day 2 of 24 of the Anglo-Soviet invasion of Iran. British troops capture Abadan along with their oilfields. Further up north, Soviet troops capture Tabriz while their planes bomb Tehran. East Africa: Day 443 of 537 of Italy's East African campaign in the lands south of Egypt. CBI - China: Day 1,512 of 2,987 of the 2nd Sino-Japanese War. ETO - France: 7,000 Jews are arrested in Vichy France. Russian Front - North: Day 353 of 872 of the Siege of Leningrad. Russian Front - North: Day 114 of 658 of the Siege of the Kholm Pocket. Russian Front - Center: Day 28 of 64 of the 1st Battle of Rzhev-Sychevka, Russia. The Soviets announce that along the Moscow front they have pushed the Germans back 15 to 20 miles within the last two weeks. Russian Front - South: Day 4 of 165 of the Battle of Stalingrad, the bloodiest battle in human history. Russian Front - South: Day 60 of 150 of Germany's CASE BLUE. German troops capture Mozdok, Russia, 50 miles west of Grozny. East Africa: Day 114 of 186 of the Battle of Madagascar. CBI - Burma: US B-25s bomb at Lashio, an important rail center, highway junction and air base. CBI - China: Day 1,877 of 2,987 of the 2nd Sino-Japanese War. Day 104 of 124 of Japan's Zhejiang-Jiangxi Campaign, launched to punish anyone suspected of aiding the Doolittle raiders in China. Roughly 250,000 Chinese will be killed. PTO - Alaska: Day 81 of 435 of the Battle of Kiska, Aleutian Islands. PTO - Malaya: Day 189 of 357 of the Battle of Timor Island. PTO: Japanese troops capture Ocean and Nauru Islands. PTO - New Guinea: Day 37 of 119 of the Battle of the Kokoda Track. US 5th and 13th Air Forces provide air support. PTO - New Guinea: Day 2 of 14 of the Battle of Milne Bay. The Japanese land another 2,000 troops at Milne Bay and begin advancing up the Kokoda Trail. Most of the supplies on the beachheads east of Rabi are destroyed by the US 5th Air Force. PTO - Solomon Islands: Day 20 of 187 of the Battle of Guadalcanal. US 5th Army Air Force provides air support. ETO: The French Committee of National Liberation headed by General Charles de Gaulle is recognized by Britain, the United States and Russia. ETO - France: US 8th Air Force B-26s bomb an airfield in France. Russian Front - North: Day 718 of 872 of the Siege of Leningrad. Russian Front - North: Day 479 of 658 of the Siege of the Kholm Pocket. Russian Front - Center: Day 10 of 48 of the Battle of Bryansk, Russia. Russian Front - Center: Day 20 of 57 of the 2nd Battle of Smolensk, Russia. Russian Front - South: Day 3 of 122 of the Battle of the Lower Dnieper River in Russia. Russian Front - South: Day 45 of 48 of the USSR's Lvov-Sandomierz Offensive. MTO - Italy: Via E-boat, Otto Skorzeny arrives at La Maddalena. Later that day, he learns that Mussolini has just been transported away. MTO - Italy: The Allied Air Forces attack the airfields at Capua and Grazzanise. CBI - China: Day 2,242 of 2,987 of the 2nd Sino-Japanese War. PTO - New Guinea: Day 127 of 148 of the 2nd Battle of Lae-Salamaua. US 5th and 13th Air Forces provide air support. PTO - Solomon Islands: Day 12 of 56 of the Battle of Vella Lavella. US 5th and 13th Air Forces provide air support. ETO - France: General Charles de Gaulle leads a parade down the Champs Elysées to celebrate the liberation of Paris. French and American forces entered the city yesterday, but no one was quite sure if the fighting was in fact over. Today, however, more than a million people brave the risk and line the beautiful boulevards from the Arc de Triomphe to Notre Dame Cathedral in a massive outpouring of joy. 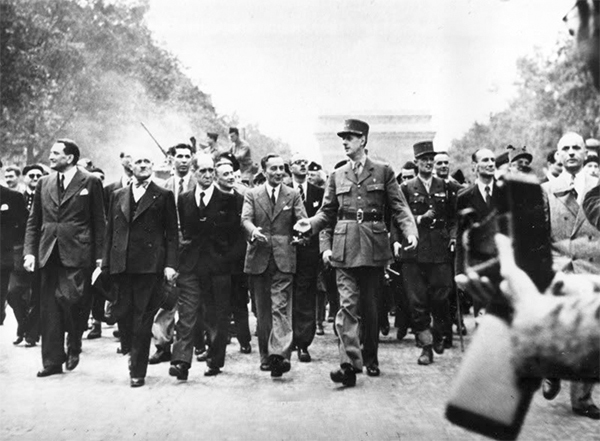 De Gaulle began at the Arc de Triomphe by relighting the flame at the tomb of the Unknown Soldier and then led the procession to Notre Dame Cathedral. As de Gaulle and his entourage worked their way through the excited crowds, a few German snipers were still active. Shots rang out from hotels, houses, and even Notre Dame's tower, killing at least six people. As people heard gunfire, they rushed to doorways and inside buildings to find protection. When the shots subsided, they returned to the streets, and then someone began ringing the bells of Notre Dame. It was unclear if de Gaulle was a target, but he appeared not to hear the gunfire. When he entered Notre Dame, more shots were fired and people dropped to the ground and hid behind the massive pillars of the cathedral. But not de Gaulle. ETO - UK: Day 75 of 86 of the V-1 "Buzz Bomb" offensive on Britain. ETO - France: Just before midnight, the Luftwaffe makes a vindictive bombing raid on Paris destroying working class neighborhoods in the northeast. ETO - France: Day 26 of 284 of the Battle of Brittany. ETO - France: Day 12 of 32 of Operation DRAGOON, the Allied invasion of southern France. Allied troops continue racing up the Rhone Valley. French troops capture Tarascon and Avignon. ETO - Germany: US 8th Air Force bombs targets in Germany. Russian Front - North: Day 17 of 28 of the Battle of Tartu in southeastern Estonia. Russian Front - Center: Day 30 of 32 of the Battle of Kaunas, Lithuania. Russian Front: Day 11 of 12 of the German Operation DOPPELKOPF in Lithuania. This was mounted to restore the connection between German Army Groups North and Centre. Russian Front - Center: Soviet troops keep pouring into Poland. Russian Front - South: Day 7 of 10 of the Battle of Romania, 2nd Jassy Offensive. Bulgaria: Germany's ally, Bulgaria, withdraws from the war against the USSR and declares themselves neutral. MTO - Greece: Hitler orders his troops to withdraw from Greece. MTO: US 15th Air Force bombs targets in Italy and Romania. MTO - Italy: Allied troops continue pressing the German line holding the Po Valley. Allied Air Forces provide air support. MTO - France: US Air Forces bomb targets in southern France. CBI - Burma: Day 148 of 302 of the Chinese Salween Offensive. US 10th and 14th Air Forces provide air support. CBI - China: Day 2,608 of 2,987 of the 2nd Sino-Japanese War. Day 132 of 259 of Japan's Operation ICHI-GO. PTO - Alaska: US 11th Air Force bombs the Kashiwabara staging area on Paramushiru Island. Later, B-25s bomb the Kurile Islands, sinking a patrol boat, while B-24s bomb targets on Kashiwabara and on Otomari Cape. PTO - Caroline Islands: US planes hits targets on Pagan Island. PTO - Dutch New Guinea: Day 56 of 61 of the Battle of Noemfoor. Although the island has been declared secured, bitter fighting from Japanese continues. PTO - Mariana Islands: The US Navy continues bombarding the Japanese positions on the Aguijan Islands. PTO - New Guinea: Day 256 of 597 of the Battle of New Britain. US 13th Air Force provides air support. PTO - New Guinea: Day 127 of 481 of the Battle of Western New Guinea. 5th Air Force provides air support. PTO - New Guinea: Day 74 of 80 of the Battle of Lone Tree Hill. CBI: Former Allied POWs in mainland China are air-dropped supplies. China: The Shirakawa POW Camp in southern Formosa (Taiwan) is closed. CBI - China: Day 2,973 of 2,987 of the 2nd Sino-Japanese War. Day 18 of 25 of the Soviet Invasion of Manchuria. Soviet troops occupy the Kurile Islands north of Japan and take the first of what will become 63,000 prisoners of war. As the Allies struggled inland from Normandy in August of 1944, the fate of Paris hung in the balance. But Paris endured, thanks to a fractious cast of characters, from Resistance cells to Free French operatives. The history of Sikorsky Aviation and its founder, Igor Sikorsky, one of the most talented and versatile aeronautical pioneers in history. 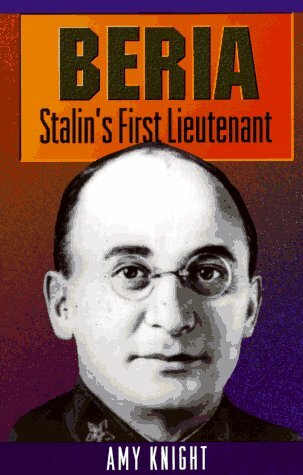 Lavrentii Beria came to symbolize all the evils of Stalinism, yet eventually found himself a victim of Soviet purges, too.